Gary Schwitzer is publisher of HealthNewsReview.org. He has worked in health care journalism for 44 years. He led a health journalism graduate program at the University of Minnesota and taught media ethics there for 9 years. He Tweets as @garyschwitzer, or using our project handle, @HealthNewsRevu. 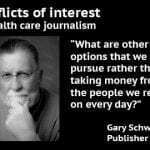 Many journalists are aware of the drug industry’s attempts to gain positive attention by buying placement within the nation’s health care news. A few occasionally write or talk about it, as Harder and Rosenthal did publicly. 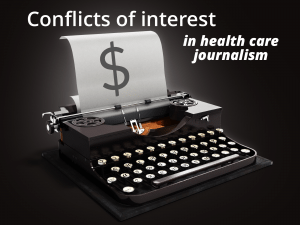 But who talks about conflicts of interest in health care journalism? 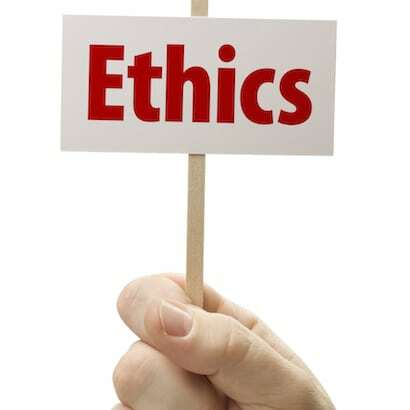 In a Gallup poll, “Honesty/Ethics in Professions,” respondents rated journalists’ honesty and ethical standards below psychiatrists, chiropractors and bankers….and just above lawyers. That’s why I think that this issue demands and deserves a deeper dive. Why now? Because, as outlined in this series, there are a growing number of questionable alliances between a growing number of news organizations and health care industry sponsors. Money is exchanging hands and I ask “Why? Why do news organizations enter into these arrangements? Why do they feel they need to? Have they exhausted all other options?” I want to shine a light on a collection of news organization practices. I’m raising the same types of questions that journalists often raise as they report on various issues. But I’m asking them because I don’t see enough journalists talking about it when their own organizations accept industry money. 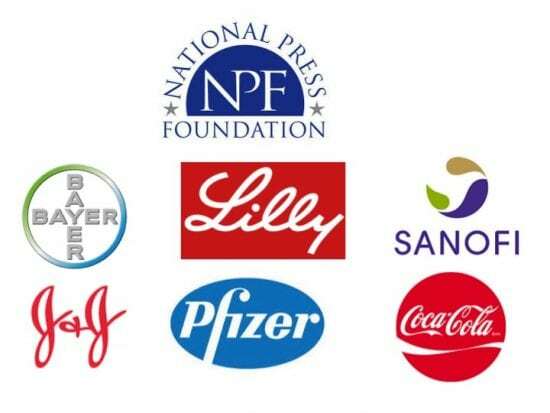 We have written many times about the National Press Foundation (NPF) offering all-expenses-paid trips to health care journalists for workshops that are sponsored by drug companies (or by Coca-Cola). We have written twice about how STAT has accepted sponsorship from the industry group, the Pharmaceutical Research and Manufacturers Association (PhRMA). They have also accepted sponsorship from individual drug companies, from health care providers and other health care industry entities. See articles by Trudy Lieberman and, later, by me. NPR lists PhRMA as a supporter. 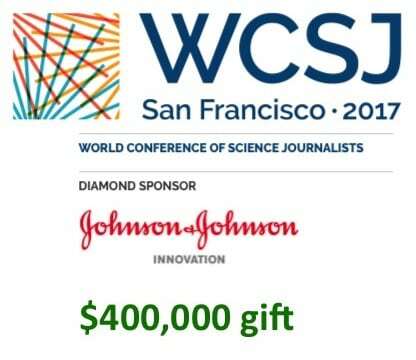 This October the World Conference of Science Journalists will meet in San Francisco, with several big bucks drug company sponsors. Johnson & Johnson is currently the top donor, at $400,000 . Bayer gave at least $50,000. Nearly a half million just from two drug companies. Local television news has, at times, been a cesspool of troubled advertising, sponsorship and content-sharing deals with vested interests in the health care industry. We’ve written about these issues more than 15 times but this is such a firmly-entrenched practice that we’re not sure that another 15 articles would do any good. Some who teach journalism – if they lead by example – are not giving the best example for their students and for the public. We broke the story about a University of Kansas journalism project that has ties to Purdue Pharma, makers of OxyContin. “I feel like I was lied to,” (then-journalist Kristin) Jones told The BMJ. Jones no longer works as a journalist but said that she would not have attended the conference had she known of Coca-Cola’s funding. But would the Mayo Clinic be a more appropriate sponsor for a journalist training program? We will look more closely at an example in part 2 of this 3-part series tomorrow. I wrap up this introductory overview by emphasizing a few things. The three news organizations (STAT, Vox, NPR) mentioned earlier for accepting PhRMA sponsorship are three that I respect and admire as much as any in journalism. I may be naive, but I do not believe they would allow sponsorship to influence editorial decision-making. However, it is because of the pedestal that I put them on that I expect and wish for a better example. Why did they feel compelled to accept support from an industry lobbying group whose members and whose members’ products they cover on a regular basis? Would these organizations accept political news coverage sponsorship from the Trump 2020 campaign or from any other politician? Would these organizations accept public health/tobacco control news coverage sponsorship from The Tobacco Institute? I don’t think so. But in health care news, some news organizations look the other way or directly solicit such support. It is tone deaf, a terrible example, and should raise questions in the minds of news consumers and health care consumers. It leaves a cloud of doubt hanging over the news – and that is a problem. With all of the spurious attacks on journalism – one need look no further than the current White House occupant – you would think that journalists would do everything possible to avoid raising more doubts about conflicted news. You could say that these organizations should be concerned about the potential for, or the perception of, a conflict of interest. But an important Viewpoint article in that recent Journal of the American Medical Association special edition on conflicts of interest in health care was entitled, “Why There Are No ‘Potential’ Conflicts of Interest.” The authors argued that distinctions between perceived/potential conflicts and actual conflicts are “misguided.” A conflict of interest, they posit, “describes a situation in which there is a risk of bias and resulting harm, not a situation in which bias or harm necessarily occurs. 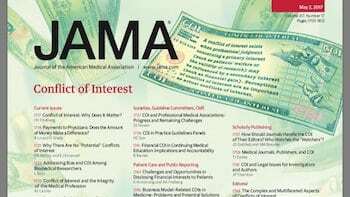 Thus, a situation marked by risk of bias from a secondary interest is no less a COI because it does not result in bias or harm.” There is a polluted stream of health care news and information to the public and any source of the pollution should be eliminated. Some news organizations might say, “Well, do you want us to go out of business?” That is a false dichotomy; it is not a choice between only two alternatives of “Take conflicted money or go out of business.” Have news organizations that accepted pharma funding first exhausted possibilities for foundation support? Kaiser Health News and ProPublica are two outstanding journalism efforts that depend on foundation funding. I know that may raise another set of issues about intellectual conflicts in foundation funders – a topic for another time. Instead of taking drug company money, have these organizations pursued other sponsors that have health-related product lines that they’d like to advertise? FitBit, Nike or any other sports shoe/sportswear manufacturer, LifeTimeFitness or any other fitness center chain? I could keep an advertising department busy with a much longer list. Our publishing effort doesn’t accept pharma money. We don’t accept any advertising. We’ve survived for 11 years solely from philanthropic foundation support. I’d shut this project down before I’d take drug company money. I went 19 months without funding. I turned down an invitation to speak at the Aspen Ideas Festival this summer because the organizers accept drug company support. I once resigned my position as the head of the CNN medical news unit because of evidence of sponsor influence on editorial decision-making that occurred over my head and behind my back. So I don’t just talk the talk; I walk the walk. 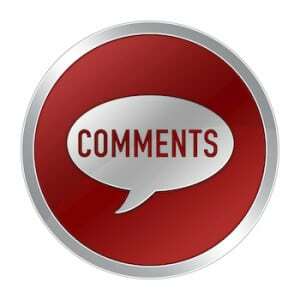 I welcome comments and encourage a dialogue about these issues but, true to our Comments policy on this site, we will not post any ad hominem attacks. Read our policy before you leave any comments. We didn’t make any personal attacks. In fact, we state our deep admiration and respect for some of the news organizations we mentioned. So please shine light rather than shed heat. Our goal in writing about these topics – which few others have chosen to ever address – is to find solutions and to help navigate the polluted stream that now exists. 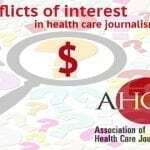 Come back for part two of the series on June 13: Time for the Association of Health Care Journalists, arguably the world’s top health journalism professional organization, to reconsider its fundraising practices. And part three on June 14 includes a video in which I talk about why this trend bothers me – namely, that this is vital health care news we’re talking about, not sports or fashion or dining news. On the other side of the ocean, here in the Old Europe, the problem does also exist . One example : for the recent ASCO meeting in Chicago sevral journalists from France have travelled to Chicago , slept and eaten at drug companies expenses. Some have even spent between zero and one hour at the conference venue. The companies were ‘kind enough’ to provide opinion leaders for daily briefings about what was ‘important’. As one may imagine it was a totally objective and unbiased approach ! What is funny is that these journalists work for news media which love to find scandals , real or false, in which physicians and drug companies are involved. This first in the series on conflicts of interest in journalism is about the best thing I’ve read on the subject, ever. I like how it was peppered with the most exacting metaphor: pollution. “polluted stream of contaminated journalism”, “cesspool” etc.. Very vivid. “We need clean, clear health information as urgently as we need clean, clear water.” When you think of the immense loss of life (especially among the young) that happens needlessly on the planet due to polluted drinking water, one cannot help but feel sorrow for the state of humanity. Ditto when we see public health information so carelessly, and needlessly polluted. Kudos for taking this on. Its good to see you back in long form. I have missed your writing presence. So my question is this. Is it better to have a well intellectualized, mainstream outlet doing investigative pieces and being transparent about sponsors–accepting potential harm–or not having the stories at all? My premise is this, and I am sure you will challenge: upsides>downsides. Again, I am asking. I would like to hear your opinion. I’ve been here all along – for 11 years. But you’re correct: I’ve stepped back to a large degree from daily – and especially long-form writing – to become more of a public ambassador for this not-for-profit project and to pursue acceptable funding for our future – a daunting task. But another example of how we don’t just talk the talk, we walk the walk. Some news organizations might say, “Well, do you want us to go out of business?” That is a false dichotomy; it is not a choice between only two alternatives of “Take conflicted money or go out of business.” Have news organizations that accepted pharma funding first exhausted possibilities for foundation support? My recurring question is “Why?” Why do news organizations that cover health care entities apparently feel that they must take money from those entities? I will address these questions again in part 3 of our series on Wednesday. Please keep coming back. Journalists and outlets who cover politics usually don’t take money from political parties or PACs. Is there a fundamental difference to taking money from pharma companies? Great analogy–asking whether news organizations accept political news coverage sponsorship from the Trump 2020 campaign or The Tobacco Institute? Somehow the news (and plenty of other) organizations can still convince themselves that drug companies are there to primarily cure and stave off disease, rather than to sell, the primary function of any company.